Activity of soil can be defined as ration of plasticity index to clay fraction as percentage. F= clay fraction expressed in percentage that are finer than two micron. The amount of retained water or state of water in soil mass depends upon available clay mineral in soil. Activity of a soil assesses capacity of soil to hold water. Obviously this term is applicable for clayey soil. We have discussed many aspects of expansive soil and its common variety black cotton soil in our previous posts. The main factors that are concerned in designing foundation on clayey soil of that type is its swelling potentials; shrinkage is also equally important. The volume change that results swelling and shrinkage depend on activity of clay soil. We will discuss about significance of these parameter in our next post. Now we will learn about how can activity of soil can be determined? For a particular soil, clay fraction and plasticity index are measured to prepare a plot, plasticity index vs. clay fraction. Definitely we have to take three or more sample to determine straight line as shown in figure below; clay fractions are in abscissa and plasticity index in ordinates. As stated above a straight line is found for particular soil, points corresponds to samples lies in straight line. Activity is derived conveniently from slope of straight line. A steeper slope represents greater activity. 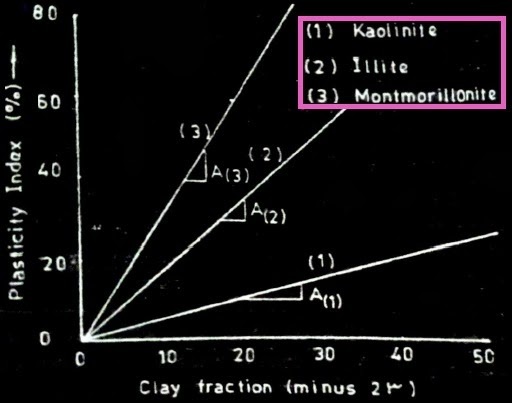 In figure we are providing plot for clay soil containing different clay minerals (kaolinite, illite, montmorillonite).